5 Summertime Adventures in Whistler, B.C. We’ve just visited Whistler, British Columbia, and going in we weren’t sure what to expect, since it’s a famous ski resort and we were going in early summer. We had in mind our February 2010 visit to Mount Ruapehu in New Zealand, a well known spot for skiing during the Southern Hemisphere’s winter. This volcano is also famous for crawling. Remember Frodo, Samwise, and Gollum from the Lord of the Rings? They’ve crawled here! Because this is was Mordor in the Lord of the Rings movies! Whistler Mountain is a Canadian prime ski destination. 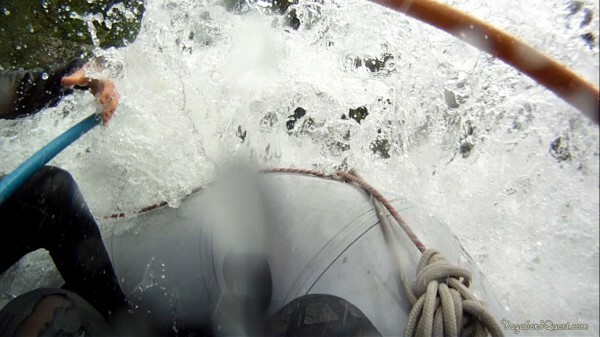 It’s very close to Vancouver, just a 2 hour drive, making it very reachable. Some venues of the Vancouver 2010 Winter Olympics were here in the Whistler area. So the name Whistler is associated with winter outdoor sports and activities. That’s why we were surprised to see how vibrant this resort village and surrounding area are during the summertime! Expecting a ghost town, we found that this winter wonderland is now home to various summer outdoor activities and adventures. 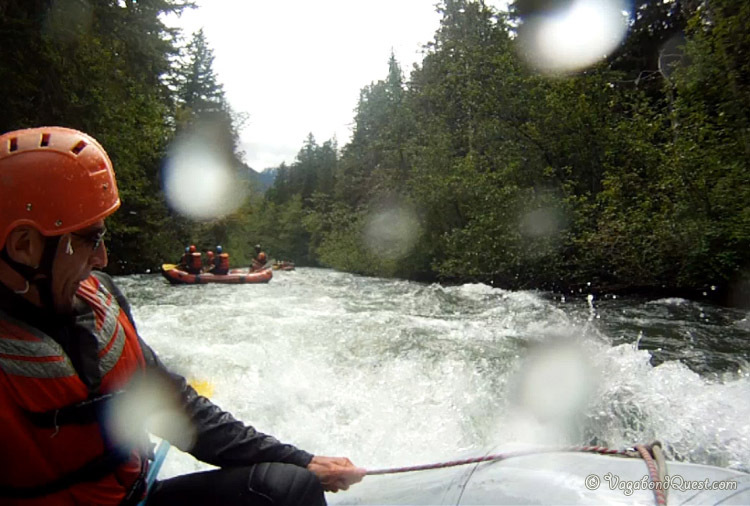 To name a few: rafting, cycling, mountain biking, golfing, hiking, trekking, kayaking, and ziplining. Even for lazy-bones, Whistler is a lot of fun! 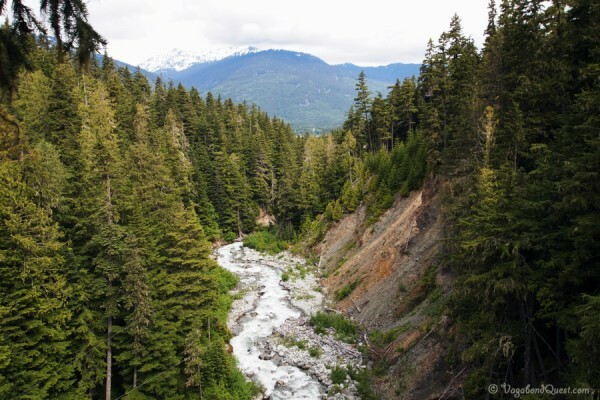 The scenery around Whistler is stunning with snow-capped mountains as a backdrop and pine forest carpets spreading below. The whole chairlift and gondola system makes this mountain very popular for sightseeing. So let’s see the 5 summer adventures we had in Whistler! Ryan and heights don’t mix well, but he was somewhat prepared for ziplining after our jungle adventure in Costa Rica. The Ziptrek Bear Tour ziplines over Fitzsimmons Creek. Stunning view! 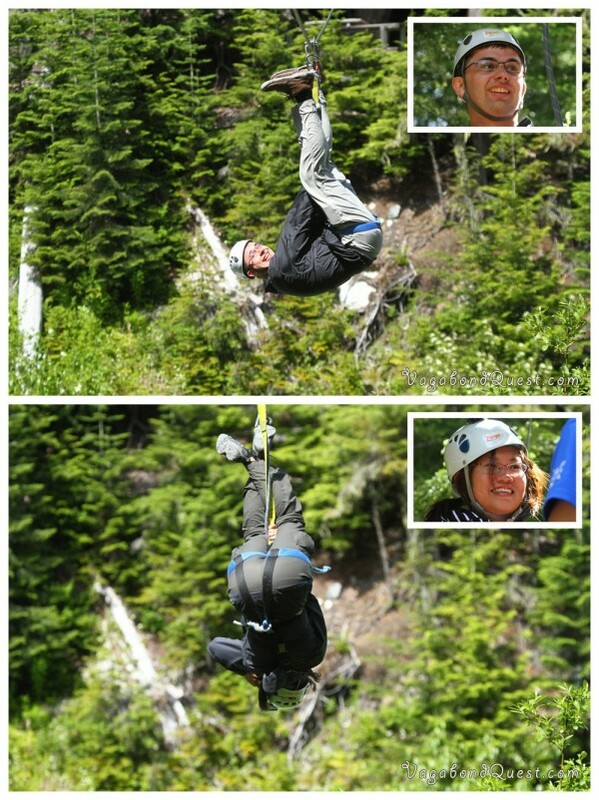 The longest zipline in Bear Tour was over 300 meters long. Longest and with the best view as well. 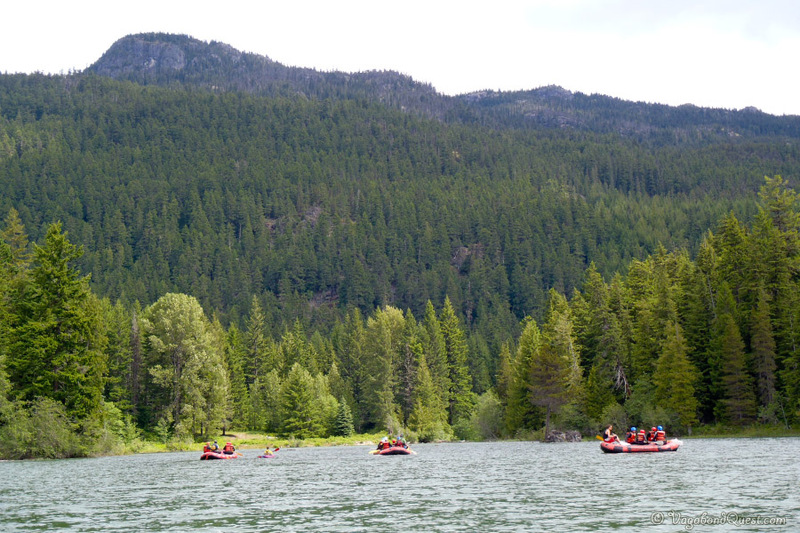 You’ll go along the river, with canyon walls on either side, facing a beautiful snow capped mountain in the distance. Well, that’s if you decide to zipline facing forward normally. Not in my case. I tried to do an upside down “cannonball”. The view is even more amazing this way: upside down pine trees at cannonball speed, wild!! Despite of Ryan’s fear of heights, ziplining included, he managed to go upside down too! People back at home probably won’t believe that, but here’s the photo proof! We went rafting with Wedge Rafting through some amazing rapids and breathtaking scenery. Just don’t fall in, the water is freezing cold, especially after a stream from a melting glacier joins the river. Still, we were comfortable in our wetsuits. It was a hell of a lot of fun! 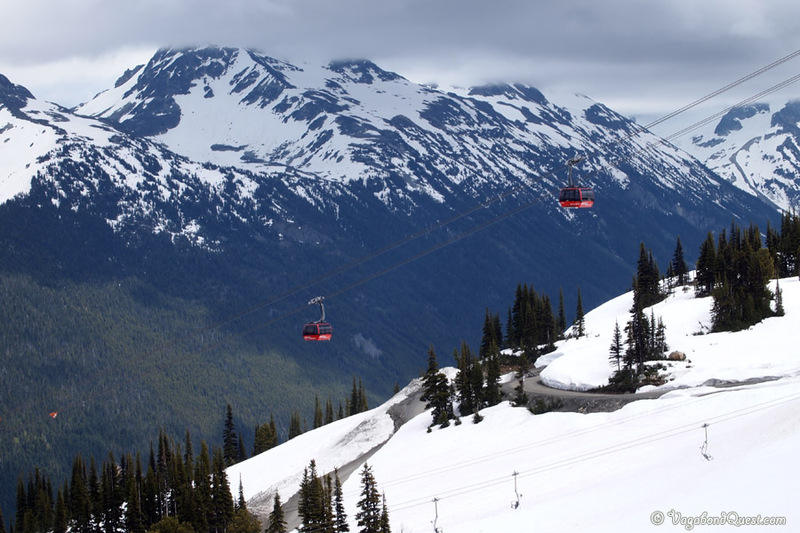 What’s the best way to move between Whistler Mountain top and Blackcomb Mountain top? Peak 2 Peak Gondola, of course! With a length of over 3 kilometers, it holds the world record for the longest free span between ropeway towers! It soars up to 436 metres away from the ground, and some gondolas even have a glass floor, so you can see the pine trees right under you! The view? Just stunning! 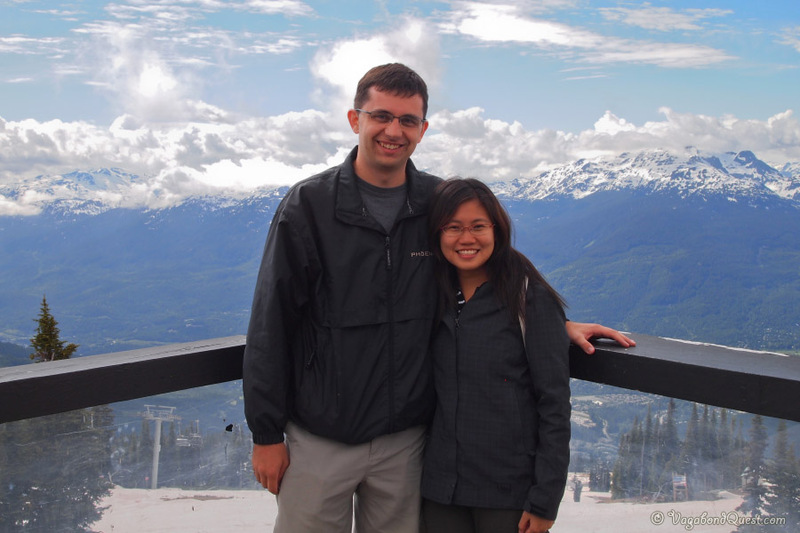 Ryan seemed to like the Whistler town view, while I think the magic is in the snowy mountains surrounding it. The top of the mountain is still snowy in the early summer. We’ve never tried to jump high on snow before, because, well… it’s difficult, and the heavy winter coats often make us stiff. 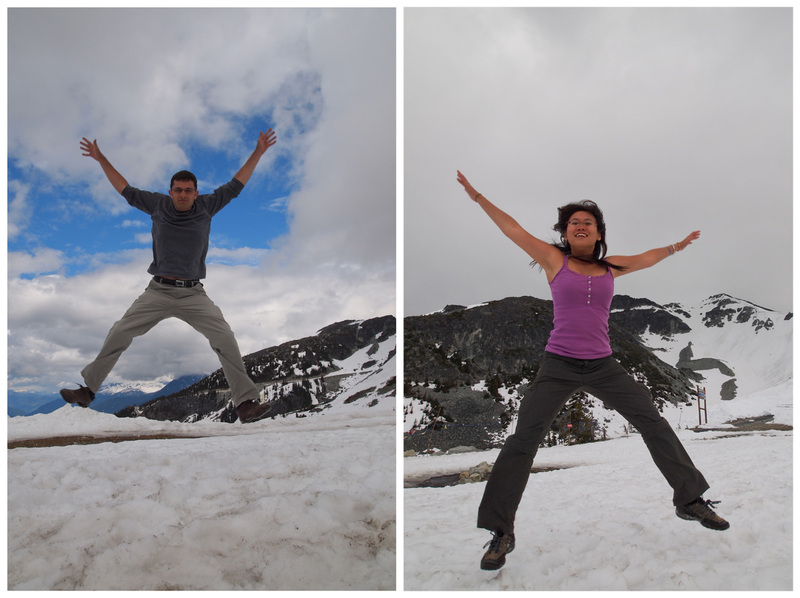 So here we go, took off our coats and jumped as high as we could in a foot of soft snow! 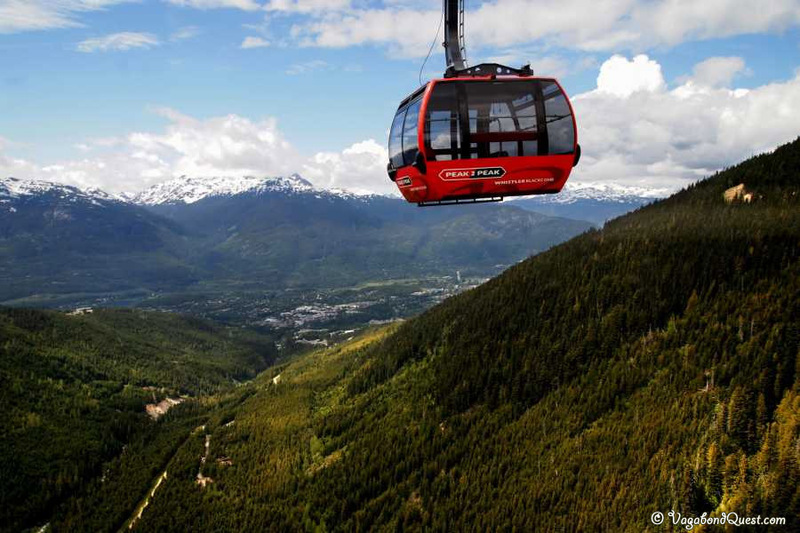 From the village on the bottom of the mountain, you can take a cable car from Whistler Village or a ski chair lift from Blackcomb Village. In the winter, you can ski down the mountain, back to the village. In the summertime, you can hike back down or mountain bike. Not very ambitious? Just want to absorb the gorgeous scenery like us? Just go down with either chair lift or cable car! And oh, don’t forget to spot the black bears that live around the mountain! We saw 2 on the way up, and 2 on the way down. Awesome! The scenery around this area offers stunning backdrop for your golf game – and there’s a chance you might spot bears roaming the golf course. 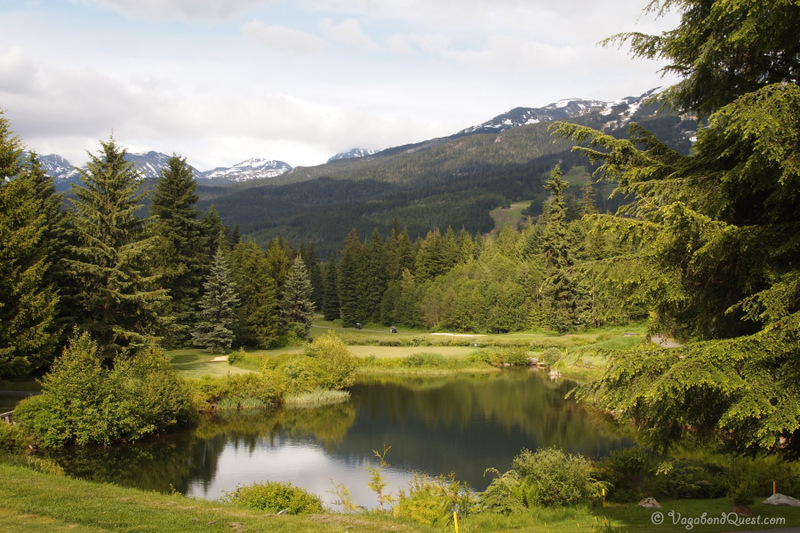 We did 9 holes at Whistler Golf, yay! Visit this aboriginal cultural centre if you have time. In here you can learn about 2 of the BC First Nations, Squamish and Lil’wat. They have an Istken, the traditional underground pit house used by Lil’wat people in the past. Totems, blankets, boats, decorations, and so on. They even have a totem pole and a canoe under construction, in the front yard of the building. Hungry, we visited the cafeteria. Surprise surprise, they have some unusual and delicious things on the menu! Bison and wild bear smokey sausage? Indian taco with homemade venison chili? Interesting and mouthwatering. Now, let’s talk about food a little bit. I had my craziest hot dog ever in Whistler! How can a hotdog be crazy? Well, in Dinky Dawgs, they have various crazy toppings that I’ve never seen anywhere else used for hot dog. 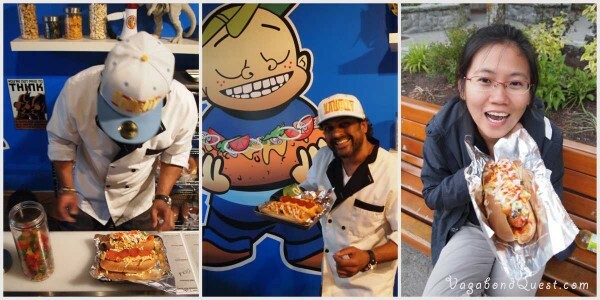 Let see: Marshmallows, smarties, potato chips, nori seaweed, and even…. gummy bears! And list continues! I ordered mine with the nori, potato chips, corn, and gummy bears. Mmm… among other things! I was sceptical it was going to be any good. Surprise surprise, it was the most delicious hot dog I’ve ever had! The seaweed gave this ..well… seaweedy taste. The potato chips made my hot dog crunchy. And what about the gummy bears? The gummy bears melted when toasted, and gave a sticky yet velvety sweetness with a fruity flavor to the hot dog, it was soooo good! Ryan was totally jealous of my gummy beary hot dog. Must try if you go to Whistler, I say! And when you go, tell Duran we recommended it to you! Our receptionist at Aava Hotel recommended Alta Bistro for us. And wow, this has got to be one of our favorite restaurants! 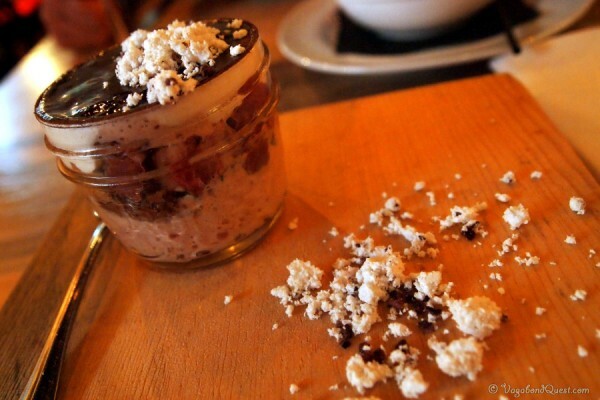 For my second course, I had Alberta Elk Tartar and Yarrow Meadows Duck Liver Parfait. It was incredible! Not just about the taste, but also about the texture! There are some crunchiness, powdery softness, meatiness, and many other sensations, all at once, in every single bite. Not very often we eat something amazing like this. Ryan’s charcuterie came with homemade fiddlehead pickles from local BC ferns. The best pickle I’ve ever had! Too bad they wouldn’t sell us a jar, because their stock was limited. Quite rare having food this level in such affordable price. Three course meals start from 19 bucks! And for the drink, I tried a homemade non-alcoholic cocktail “From The Garden.” Very refreshing! I think the people of Vancouver are lucky to have Whistler only 2 hours away from their home town. What about you? What’s your favourite summer activity?